Roederer’s 1929 Brut is impossibly beautiful. Wearing the graceful patina of age, the 1929 is more of a wine than a Champagne. Hints of apricot jam, spice and orange-infused oil grace the palate in a silky, wonderfully pliant Champagne endowed with remarkable brilliance, purity and freshness, especially for its age. According to Roederer’s Chef de Cave Jean-Baptiste Lécaillon, the 1929 is 80% Pinot Noir and 20% Chardonnay. At the time, the Brut was made entirely from estate-owned vineyards, mostly in Verzy and Verzenay. 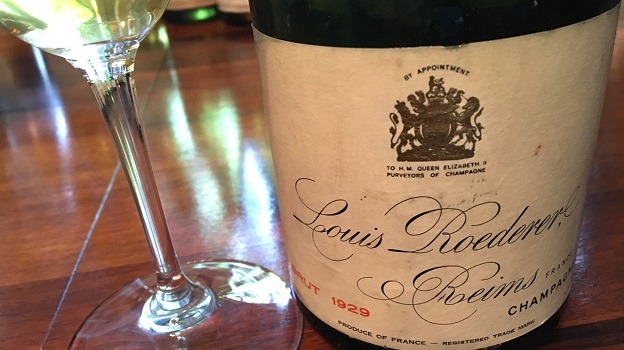 This bottle was disgorged in 1970 with just seven grams of dosage, which is low for both the era and current releases, but probably a downward adjustment taken to reflect the long period the wine had spent on its lees. Lécaillon adds that the 1929 got a hit of Cognac just before its initial bottling, a step that was common at the time to boost the alcohol in finished Champagnes. And what about 1929? Herbert Hoover was the US President when the US stock market crashed, setting off the Great Depression. The Dow Jones would not recover to its pre-Depression level until 1954, 25 years after the crash. In Europe, totalitarian regimes were on the ascent in Italy, Germany and Russia. In France, Nobel Peace Prize winner Aristide Briand became the Prime Minister for the fifth time (he would ultimately serve seven times) and presented his blueprint for a unified Europe. In Champagne, 1929 is remembered as a very high quality vintage in terms of both quality and production, with an even flowering and no real weather issues until rot appeared at the very end of the harvest. Roederer’s 1929 Brut has proven to be timeless. Even today, it is striking. 94/Drink now.